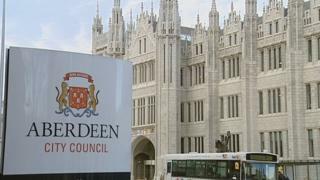 About 200 jobs could go at Aberdeen City Council amid almost £45m of budget cuts, the local authority has warned. The Conservative and Labour administration is proposing a 4.79% rise in council tax from April. They warned some libraries could also close as the local authority prepared to decides its annual budget next week. Co-leader Douglas Lumsden warned about 200 posts could go in the coming year - but said the authority was committed to making no compulsory redundancies. The 4.79% increase in council tax would generate more than £5.5m of additional income. It would see a Band D property council tax rise from £1,267 to £1,328 - £5 a month more. Among other proposals, scrapping school crossing patrollers and closing public toilets could save more than £500,000. Community centres could also be at risk. Cuts are also proposed to some charities and arms-length organisations, such as the Aberdeen City Health and Social Care Partnership Integration Joint Board (IJB) and Sport Aberdeen. Mr Lumsden told BBC Scotland: "We did say things were not looking good. There is going to be very tough options that we have to choose next Tuesday, we won't be able to get away from that. "There is going to be some big changes. "It looks like a couple of hundred posts within the council that would be reduced." The Scottish government recently agreed to increase the amount of money given to councils across the country. The council had warned in December that services and jobs could be at risk.